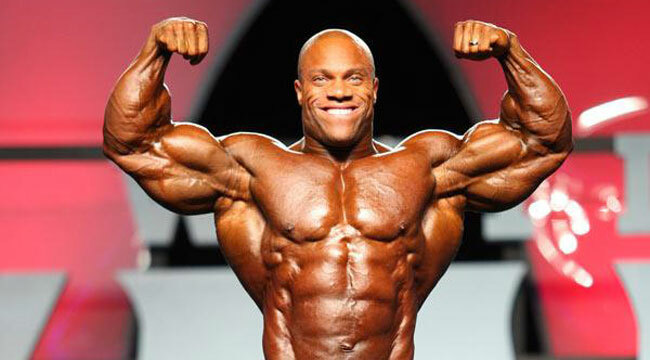 Follow bodybuilder Phil Heath's muscle-building nutrition plan to gain quality muscle. Time was, if you were a professional bodybuilder, you were expected to eat and eat and eat, until you could eat no more. You'd stuff your piehole morning, noon, night - especially at night - in an attempt to pack on the pounds any way you could. Burgers were fine. Pizza was better. And don't forget the ice cream. You gotta have the ice cream. As a result of such gluttonous behavior, off-season bodybuilders were often mistaken for sideshow attractions rather than the athletes they aspired to be. Somewhere along the way during its first century of existence, competitive bodybuilding transmogrified from a quest to achieve the ideal male physique to an all-out race to out-roly-poly the next guy. >> Looking Good: "My job title is Professional Bodybuilder, so I feel I should look like one not just for a couple of weeks out of the year but for the whole year," says Phil. >> Feeling Good: "When I'm too heavy, I just feel slow and lethargic. A little bodyfat is a good thing for the extra energy it gives you in the gym, but too much of it and I feel like a slob." >> Good Times: "It's so much easier to get ready for a contest when you have only 20 pounds to drop instead of 50. I was ready for Colorado so far out that I was really relaxed the last weeks leading up to the show instead of suffering to lose those last few pounds."